A brand name in Bicycle parts that spells the latest in technology, reliability and dedication to 100 % satisfied customers. Parker Cycle Industries follows the universal percept of dedicated pursuit. The company had been established in 1958 as manufacturer of wide range of Bicycle Parts. From the day one of its foundation by Mr. G.L. Pahwa, as a very small manufacturing unit - It has evolved to establish International quality products. Mr. Bhupinder Pahwa, joined the family business in 1986 and has established ‘PARKER’ as a world reknown brand and since has risen from local Ludhiana market to all over INDIA and now to all corners of the world. ‘PARKER’ brand of Bicycle Parts are manufactured using the most technologically advanced machines operated by skilled labour force. 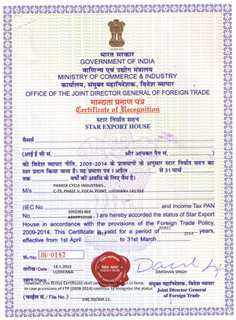 The goods are highly regarded and have proved to be the most reliable and no complaint products. 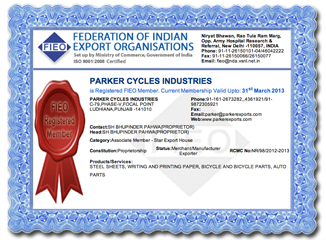 Parker Cycle Industries now exports to all corners of the world including Europe, Africa, Middle-East, South America and South-Asian markets. The Pahwa’s have always been dedicated to provide their customers: total satisfaction through their FAIR dealing. The company has been offering their excellent quality products at the most competitive price along with timely deliveries and excellent packaging. All due care is taken from procurement of the raw-materials to get the best quality finished products using high-skilled and specialized techniques at all levels by its Engineers. The company also has a strong team of quality control experts who check the quality at each and every level. They are made to realize their responsibility and know the core values of the company. The company under the guidance of Mr. Bhupinder Pahwa, is no more just a bicycle company. The Pahwa’s, lately, have expanded their product portfolio and now have also been manufacturing and dealing in Steel Sheets, Paper and Automotive Part’s.